Wyoming Center for Political Economy: How Big Is Government in Your County? How Big Is Government in Your County? I recently reported that GDP growth in Wyoming has come off another temporary spurt. It also looks like the upward trend in oil prices is coming to an end. Both these factors have obvious negative consequences for tax revenue, both at the state and local levels. Rumor has it that the overall legislative strategy for the 2019 legislative session will be status quo: no tax hikes for the welfare statists; no spending cuts for the fiscal conservatives. It remains to be seen if this is where the power struggle balances out - my suspicion is that the fiscal conservatives will come up short - but regardless of how the game actually plays out, the reality of our state's economy remain what they are. There are two components to that reality, the first of which is the weak economy and thereby the weak tax base. This can only be remedied with fiscal and regulatory policies aimed squarely at reducing the burden of government on the private sector: lower taxes - not more taxes - and a structured, economically intelligent rollback of regulations. The other component is our big-spending government. There are overlaps between the tax-revenue problem and the big spending problem, the most obvious of which is that the more government spends, the more of our money it will lay claim to. However, there is a deeper, structural relationship that is rarely discussed in the public debate: the crowding-out effect that government has on the private sector. Government pays better than the private sector. Employee compensation in state and local government is, on average, 21 percent higher than in the private sector; if we deduct minerals from the private side - a fair operation for analysis of local government but not at the state level - the difference increases to 33 percent. In some counties the difference is even higher (more on that later) compounding the problem of funding local governments. Some people suggest economic development as the solution. The long-term effects of this practice of corporate welfare is disappointing: businesses stay where tax money flows until the faucet dries up. Therefore, a much better approach is to actually address the problem at its root: we have too many government employees that make too much money compared to what taxpayers can afford. The latest county-level employee compensation data from the Bureau of Economic Analysis confirms this point: more money is earned from government jobs than from jobs in any other individual industry. As a direct result of the artificially high compensation in government jobs, and the abundance of such jobs, it is difficult for small businesses - especially upstarts - to recruit and retain staff. Long story short: we have made our state unsustainably dependent on taxpayers to stay alive and afloat. 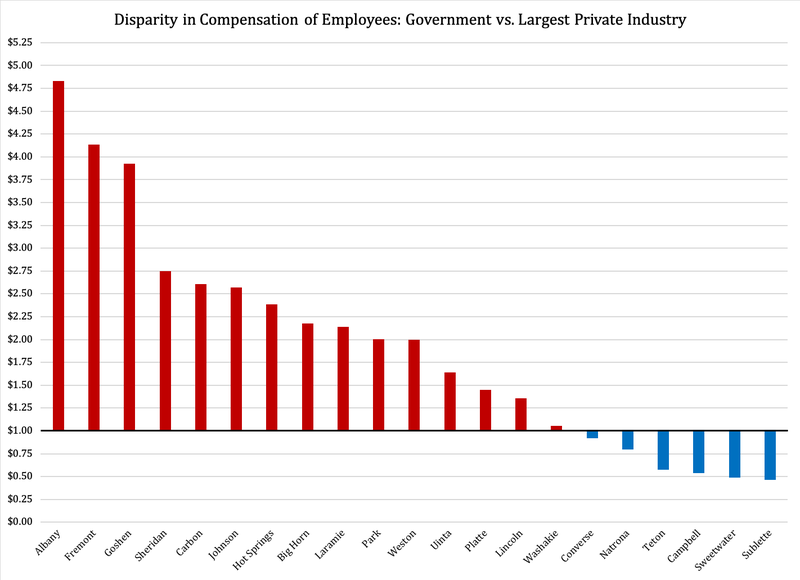 In only six counties, a private industry pays out more employee compensation than a government sector. In other words, 30.1 percent of all employee compensation in Big Horn is paid out by local government (county, city, school districts). Given the continued push for higher taxes in our state, it might be worth repeating a well-established fact: taxes do not pay taxes. *) Crook and Niobrara are excluded, as data for these two counties do not separate state and local governments.